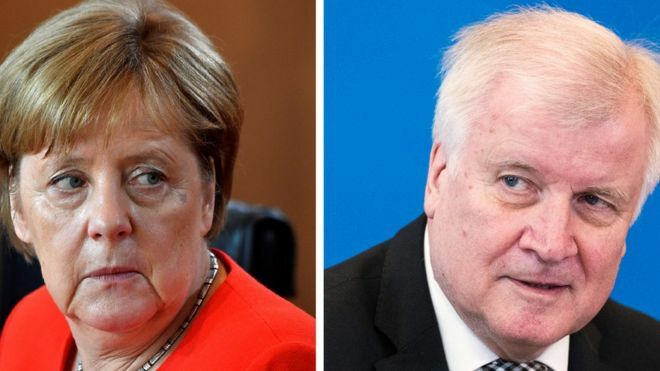 German Chancellor Angela Merkel has reached a deal on immigration to end a row which threatened to break up her four-month-old coalition government. Interior Minister Horst Seehofer, who leads her Bavarian CSU allies, has now dropped his threat to resign. Mrs Merkel described the deal as a good compromise after tough negotiation. But her centre-left Social Democrat (SPD) partners in the coalition voiced scepticism. Their spokesman on migration, Aziz Bozkurt, told the daily newspaper Die Welt that "transit centres are in no way covered by the coalition agreement". The SPD rejected a proposal for such centres in 2015, when the migrant numbers entering Bavaria from Austria were far higher than now.